Even though camping can be an amazing experience, we all know that it is never fun to set up and break down your tent afterwards. Another issue with tents comes lies in the fact that it rarely has padding and you end up sleeping on the floor. Luckily for us, a fairly new idea has been sprouting and we are proud to introduce the Tepui Autana Premium Vehicle Rooftop Tents. 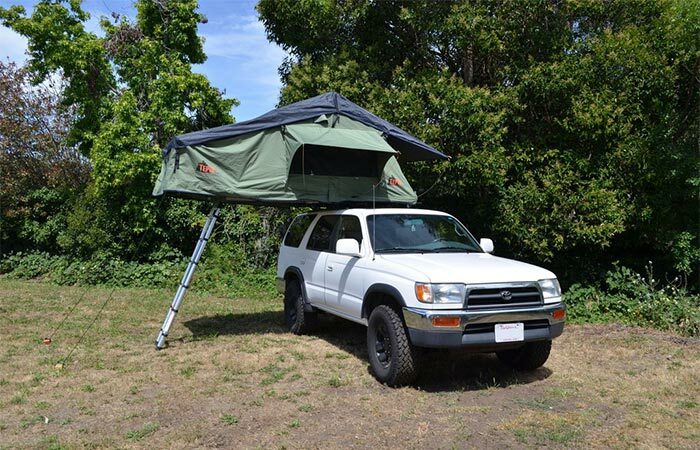 In this article, we will be featuring three distinct rooftop tents that are manufactured by tent-maker Tepui. These tents are designed to ease comfort and are super easy to set up and break down. Simply roll up and you’re ready to travel. Don’t miss out on the video below. The Autana Ruggedized version was designed to handle difficult trails. The Tepui Autana Ruggedized Tent is a super tough tent that was designed to be used in all 4 seasons. It also comfortably sleeps 3 people. The tent itself has been ruggedized and perfected for off-road vehicles and difficult trails. The canopy is constructed out of cotton canvas and double stitched 600D ripstop polyester. It also features a breathable coating. The rainfly, on the other hand, features 420D oxford polyester, and a PU coating. The travel cover is 1000D PVC. This tent also features a double wall type, and aluminum poles. It also measures 56″ wide x 122″ high x 52″ long, when opened, and has a sleeping footprint of 56″ x 96″. This tent weighs in at 195 pounds. The Autana Sky tent was designed to blend in with grasslands and desert plains. The Tepui Autana Sky Tent is also a 3-person, 4-season tent. Even though it isn’t as rugged as the Ruggedized version, it is still tough. The Sky Tent has been constructed out of exactly the same materials as the Ruggedized version. This makes it durable and waterproof, no matter what season you would like to go camping in. These tents also offer a high-density foam mattress. This means that you simply need your sleeping bags or blanket and you are set. This tent weighs in at 130 pounds. It also measures 56″ wide x 122″ high x 52″ long, when opened and has a sleeping footprint of 56″ x 96″. The Tepui Autana Siberian Camo blends in perfectly with woodland surroundings. It can also be used as a raised hunting platform. The Annex addition also gives you an extra room. 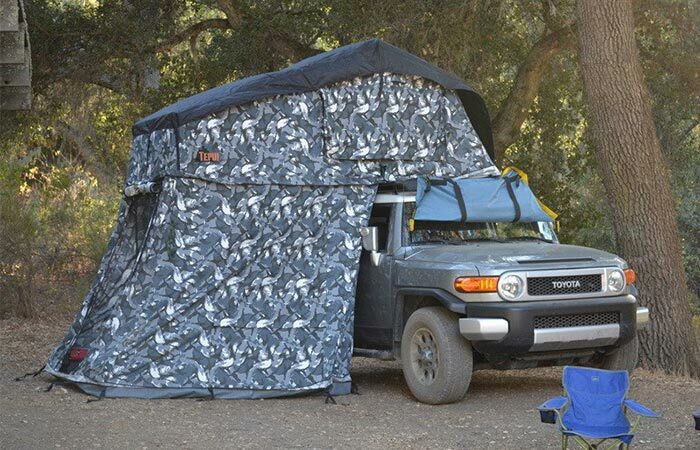 The Tepui Autana Siberian Camo Tent is also a 3-person, 4-season tent, but it has a completely different style to the others. The Siberian Camo Tent is constructed out of the same materials as the other two. This also makes it rugged and waterproof. 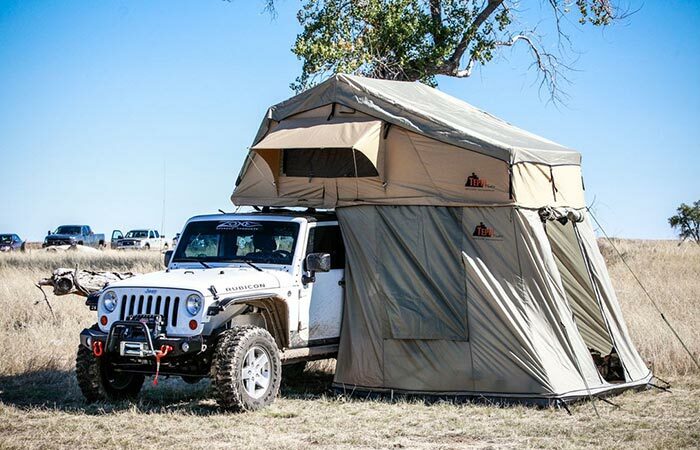 However, because of its unique camouflage design, this tent blends into the environment spectacularly. Essentially, it would be perfect as a raised hunting platform, as well as a super comfortable sleeping area. This tent also comes with a high-density foam mattress and has the option of an annex. It weighs in at 130 pounds without its annex . It also measures 56″ wide x 122″ high x 52″ long, when opened and has a sleeping footprint of 56″ x 96″.